On Saturday March 31st, 2012 a bomb exploded in the centre of Hat Yai, killing several people, and injuring over 300, including many tourists. What I wrote below about safety seems now out of date. Further information. The Thai border is only about two hours drive away, and the whole trip from Penang to Songkhla takes about four hours, excluding stops. When we decided to retire to Penang, we intended to make frequent trips to Thailand, which was another country we had considered retiring to. This way we could get the advantages of both countries. Of course, one knows about the separatist movement in Southern Thailand, and how there is often violence, with innocent people, including tourists, being killed and injured. But that is on the eastern side of southern Thailand, in the far southern provinces (Pattani, Yala, Narathiwat). It seems perfectly safe crossing the border on the western side of Thailand, and continuing north to Songkhla. This blog aims to explain the process, not our trip particularly, but, for ease of writing, I will sometimes use the first person. Malaysian immigration seems to change their procedure all the time, and I don’t know if Thailand does the same, so the procedure could vary somewhat. 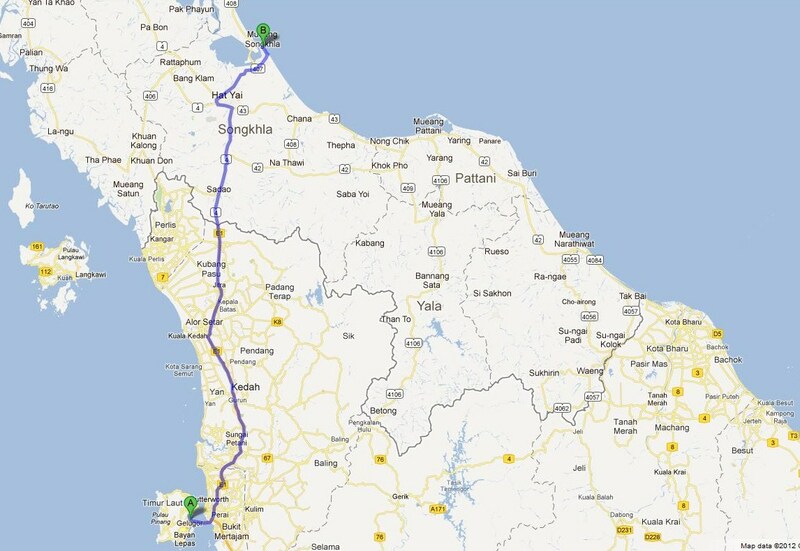 Of course, once you have crossed the border you can head off to Krabi, Phuket, or Bangkok, or wherever you want to go. We stayed in in the BP Samila Beach Hotel – look on Trip Advisor for reviews or to find where to make a booking before going. Consider making the outward and inward trips on a weekday, avoiding Malaysian and Thai public holidays and school holidays. Unless you enjoy long queues and bigger chaos at the border. You will need the car ownership documents for when you cross the border.